The Commodore 65 (also known as the C64DX) is a prototype computer created at Commodore Business Machines in 1990-1991. It is an improved version of the Commodore 64, and it was meant to be backwards-compatible with the older computer, while still providing a number of advanced features close to those of the Amiga. The latest rumor says Yes. We've heard reports from several sources of a new machine from Commodore—A 64GS, if you will. This machine is reportedly driven by a GE802, a version of the 65816 microprocessor (which is a 16-bit version of the 6502 chip), and runs at 4 MHz (by comparison, the 64 runs at 1 MHz; the Amiga, at slightly over 7 MHz). It comes with 128K of RAM and is expandable to one megabyte. Fully expanded, it supports 256 colors. Maximum resolution is a stunning 640 X 400 pixels. We've also heard that it has a 64 mode so that 64 owners can purchase a much more powerful machine and still use their software library. The 64GS reportedly comes with a built-in 3 1/2-inch disk drive and will support the 1581. But, our sources say, it does not support the 1541 or the 1571 drive (uh, excuse me, please pass the bologna). All we've heard about sound in the new machine is that it's "enhanced" and features stereo output. The final tidbit is that the 64GS will retail in the $300-$350 range when it debuts in November. The Gazette added, "Our sources also report that there is a great deal of infighting at Commodore as to whether the machine should be released. The sales staff wants to get the machine out the door, while the naysaying engineers have dubbed it 'son of Plus/4.'" While the next issue reported that "the latest rumor is that such a machine will never see the light of day", Fred Bowen and others at Commodore in 1990–1991 developed the Commodore 65 (C65) as a successor to the C64. In the end of 1990 the decision to create the C65 was taken. The project was cancelled later on. When Commodore International was liquidated in 1994, a number of prototypes were sold on the open market, and thus a few people actually own a Commodore 65. Estimates as to the actual number of machines found on the open market range from 50 to 2000 units. As the C65 project was cancelled, the final 8-bit offering from CBM remained the triple-mode, 1–2 MHz, 128 kB (expandable), C64-compatible Commodore 128 of 1985. The custom chips of the C65 were not meant to have names like the custom chips in the Amiga. Although there are names printed near the chip sockets on various revisions of the circuit board, they were not intended as names for the chips. According to former Commodore engineer Bill Gardei, "The Legend on the PCB was to let others in the organization know [whom] to go to for advice on the chips. We did have an issue with that. But that wasn't the name of the chip at the time. The 4567 was always called the VIC-3. I can see why others outside of Commodore made the connection. But again—no—we never called these chips 'Victor' or 'Bill'." In contrast to previous 8-bit computers from Commodore, the C65 has a complete DOS through which the built-in 3.5" floppy disk drive can be controlled. Disks used by the C65 have a storage capacity of 880kB and the drive is compatible with C1581. Since this format was uncommon for the former C64 owners, the C65 retains the serial IEC port for external Commodore disk drives. It's possible to use a 1541, 1571, 1581, or other similar model. The DOS itself is based on the Commodore PET IEEE 8250 drive DOS. Since it can only deal with two floppy disk drives, including the internal, only one external drive may be connected to the internal floppy disk controller. Like earlier systems, up to 4 drives can be daisy-chained on the IEC port. The C65 includes the same ports of the C64. In addition, there is a DMA port for memory expansion. The latter is attached just like on the Amiga 500 via a flap in the bottom of the board. The built-in floppy disk drive is connected in parallel, serial Commodore drives can be connected via the usual IEC port. A plug for a genlock was also provided. Only the port for the C64 datasette is no longer available, and the user port missing—like the Aldi C64—the 9 volt AC line. The expansion port differs significantly from all prior C64 variants and rather resembles that of C16. In December 2009, a working C65 on the online auction site eBay achieved a sales price of €6060. A computer with missing parts was in October 2011 sold for about 20,100 USD. In April 2013 an eBay auction reached a price of 17,827 EUR. In February 2015 an eBay auction closed at 20,050 EUR. An eBay auction in November 2016 reached 15,605 EUR. On September 7 2017 a non-functional C65 missing a VicIII chip, sold via eBay auction for USD $18,350.00. On November 2017, a C65 prototype with RAM expansion board were sold for 81,450 €. On December 30th 2017, a non-functioning C65 motherboard without most of the chips was sold on EBay for $790 US.. In April 22, 2015 the Museum of Electronic Games & Art (MEGA) announced a recreation of this computer featuring similar specifications and technologies. Also backwards compatible with the Commodore 64, the Mega 65 will feature a Commodore 65 compatible hardware recreated in FPGA and will be compatible with newer technologies such as HDMI. MEGA initially aimed to release their recreation of the Commodore 65 computer for the third quarter of 2016, but as of July 2018, the work is still in progress. ^ a b Elko, Lance (September 1989). "Editor's Notes". Compute's Gazette. p. 4. Retrieved 4 March 2015. ^ Elko, Lance (October 1989). "Editor's Notes". Compute's Gazette. p. 2. Retrieved 4 March 2015. ^ "OLD-COMPUTERS.COM museum ~ Commodore C65". old-computers.com. Retrieved 2013-06-20. ^ "Secret Weapons of Commodore: The Commodore 65". floodgap.com. 2007-07-01. Retrieved 2013-02-26. ^ a b c d e f g h i j k l m n "C64DX System specification". zimmers.net. 2009-08-18. Retrieved 2013-06-21. ^ "c65_html_1410c60e.gif". retrocommodore.com. 2012-12-16. Retrieved 2013-06-21. ^ "commodore.ca/gallery/hardware/c65.jpg". commodore.ca. 2011-03-29. Retrieved 2013-06-21. ^ "The Story Behind 'Bill' and 'Victor'". collectorcomputers.com. 2013-11-16. Retrieved 2013-11-16. ^ "C65-Auktion auf eBay". img5.imagebanana.com. 2012-11-10. Retrieved 2010-01-04. ^ "Sehr seltener Prototyp Commodore C65 aka C64DX aka C90". ebay.de. 2013-04-14. Retrieved 2013-04-18. ^ "Ultra rare Commodore 65 / C65 / DX64 prototype, working, serial #22". ebay.fr. 2015-02-15. Retrieved 2015-02-15. ^ "Commodore 65 prototype, ULTRA RARE! a.k.a. C65 / DX64 - clean and working!". ebay.de. 2016-11-06. Retrieved 2016-11-06. ^ "Commodore 65 Computer - The Holy Grail of Commodore Collecting". ebay.com. 2017-09-08. Retrieved 2017-09-08. 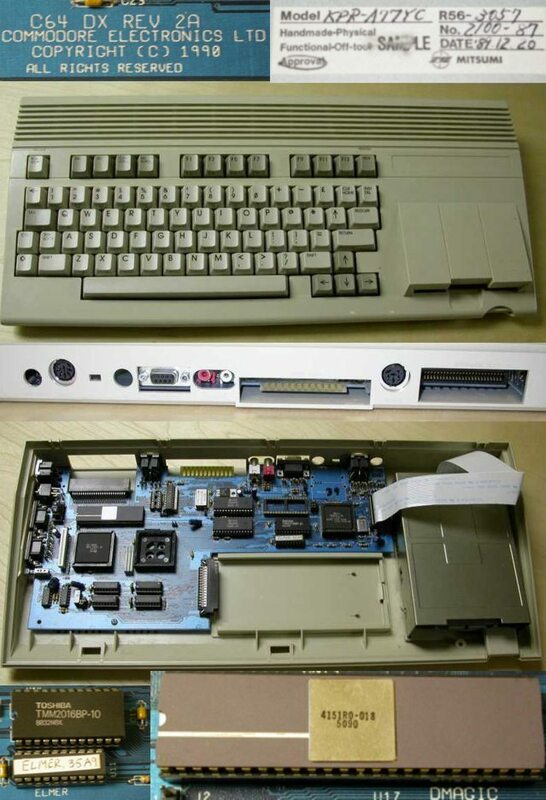 ^ "FS: Working Commodore 65 / C64DX Prototype". lemon64.com. 2017-10-08. Retrieved 2017-10-08. ^ "ULTRA RARE Commodore 65 + RAM-Espansione/c65/dx64/c90 Prototype, working!". eBay. 2017-11-08. Retrieved 2017-11-09. ^ "Commodore C65 64DX Prototype Motherboard Logic Board 65". eBay. 2017-12-30. Retrieved 2017-12-30. ^ "MEGA | MEGA - Museum of Electronic Games & Art". www.m-e-g-a.org. Retrieved 2015-10-06. ^ a b c "MEGA65 Computer". mega65.org. Retrieved 2015-10-06. ^ "Introducing the MEGA65 (8-bit) computer | MEGA - Museum of Electronic Games & Art". www.m-e-g-a.org. Retrieved 2015-10-06. ^ "MEGA 65: Commodore 65 remake gets a physical release • /r/c64". reddit. Retrieved 2015-10-06. ^ "Making a C64/C65 compatible computer in an FPGA". c65gs.blogspot.com. Retrieved 2015-10-06. On the Edge: The Spectacular Rise and Fall of Commodore (2005), Variant Press. ISBN 0-9738649-0-7. Wikimedia Commons has media related to Commodore 65. This page was last edited on 11 February 2019, at 19:30 (UTC).